Painted Red Curb - Moyers Contracting, Inc. The Gilbert Fire Department has been visiting every business in Gilbert making sure that they are complying with all of the city fire codes. One of the violations that many businesses have is that their painted red fire lane curb has faded and needs to be re-painted. That is one of the services that Moyers Contracting provides. Our operators take great pride in making sure that your painted red curb is done to perfection. We tape off the edges and lay down roofing felt when needed to catch the overspray. This gives the clean crisp look that we are known for. If the painted red fire lane curb item is marked on your check list, please give us a call and we will come out and measure what is needed and give you a price to do the work. We are in Gilbert, so we can look at it and schedule it in a timely manner. We also do fire lane signs, and other fire department related signs. Give us a call or recommend us to your neighbor. 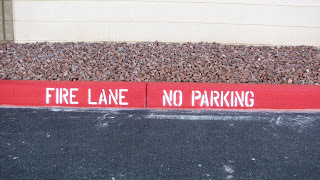 We also paint red curb in Chandler, and re-paint fire lane curb in Mesa, and if the fire department requires that you have red curb painting or fire lane signs in Phoenix, we can do it there too. Moyers Contracting has the experience to do the job to your satisfaction.